Laxmi Toor Dal is can be commonly known as split yellow peas. 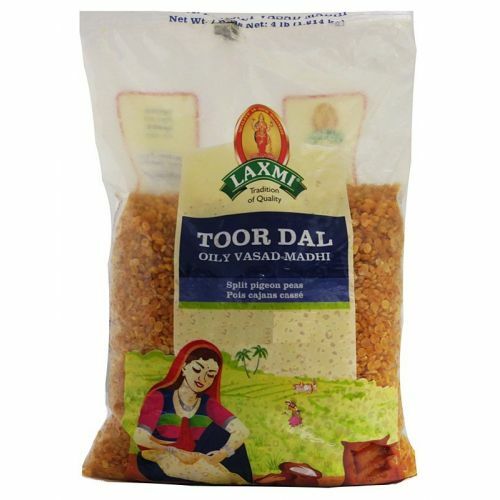 Used in traditional Indian dishes as curries, dal fry, and many others. Mild and subtly sweet flavor. They are high in fiber and low in saturated fat this dal makes an excellent and nutritious meal. Start by rinsing dal in a colander, swirling often with your hands to ensure it is fully rinsed. Place rinsed dal in a bowl with plenty of water to soak for at least 1 hour. In a large saucepan add soaked dal and 6 cups of water. Boil uncovered for 30-40 minutes, or until dal is very mushy. Drain any excess water. Set aside. You should have about 4 cups of cooked dal. In a large saucepan or wok, heat the ghee over medium heat. Add cumin seeds and mustard seeds. Saute until seeds begin to pop and the mustard seeds have turned a deep brown color. Add onions and a pinch of salt and saute until the onions are lightly browned and softened. Next add the ginger and garlic pastes. Saute briefly- just about 30 seconds to 1 minute. Add remaining spices- turmeric, garam masala powder, red chili powder, and cumin powder. Saute for about 30 seconds. Then add diced tomato and ½ cup water. Cook down until water evaporates and the oil begins to separate from the mixture. Tomato should be very soft. (Takes about 6-7 minutes). Next, stir in the cooked dal. Season mixture generously with salt to taste. Stir in lemon juice. Feel free to add more or less water to your desired consistency. Cover and simmer for 15-20 minutes, stirring intermittently to prevent sticking, to allow flavors to come together. Lastly, stir in chopped cilantro. Add additional cilantro leaves to garnish bowls of dal.